FOOD FIGHT is BACK & BIGGER in 2018! 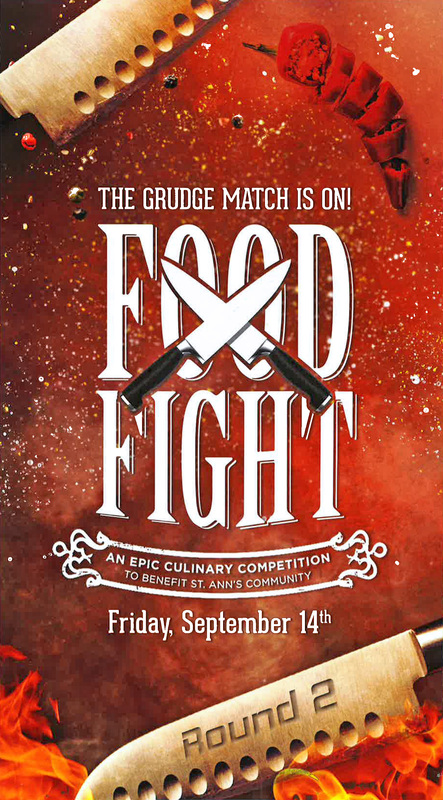 FOOD FIGHT - An Epic Culinary Competition involves four contestants competing in a 30-minute cooking challenge to make an entrée from mystery ingredients. This year’s event will feature two of St. Ann’s own Executive Chefs, along with Ellen Adams (from the show CHOPPED) and Kimberly Roth (of Gordon Ramsay’s Hell’s Kitchen fame). Four judges, all well-known individuals in the Rochester food and drink industry, select the winner. The winner of the 2017 competition, Kimberly Roth, is coming back to defend her title in a Grudge Match! Seats are selling fast! Click here to purchase yours online today! Use your mobile phone to place bids and make donations. Not ready to make the switch? Don't worry! We'll also be using the good old fashioned paddles too! For more information on mobile bidding click here or on the How Online Bidding Works tab at the top of the page. Vote for your favorite Chef using your mobile phone and help determine who will be the 'People's Champion'. For more information on the 'People's Champion' and to get to know the Chefs click here or The Chefs tab at the top of the page. Share your photos on the BIG screen using #ROCFOODFIGHT. Who doesn't like to see themselves on display? For more information and to see photos from the FOOD FIGHT Meet & Greet click here or find us on Facebook. What do you get when you put our Chefs together in the same room to take part in a press conference? Watch the video below, taken during the FOOD FIGHT Meet & Greet at Grappa, to find out. What do our FOOD FIGHT judges have to say? Watch the video of Linh Phillips, Food Blogger, author of Sir Rocha Says, below to find out! Missed out on last year? Watch the highlights below!